This is my new favorite sandwich recipe! 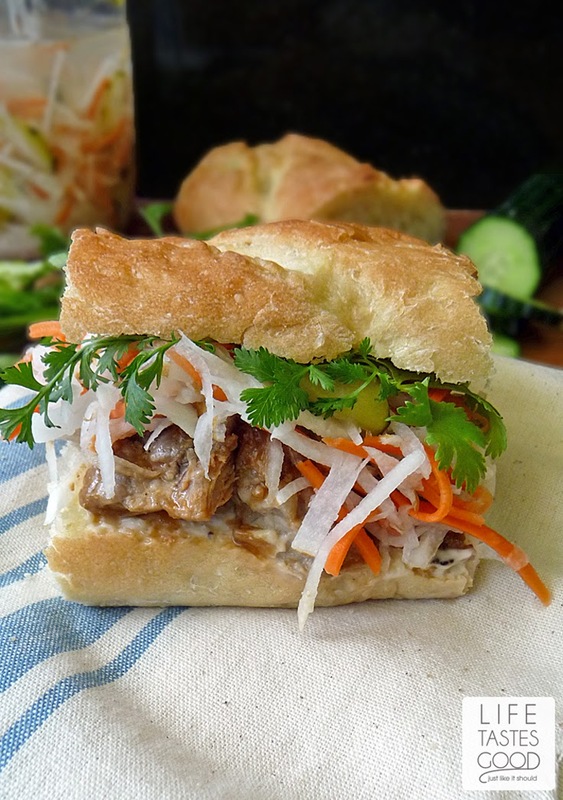 Have you ever had a Vietnamese Pork Sandwich? 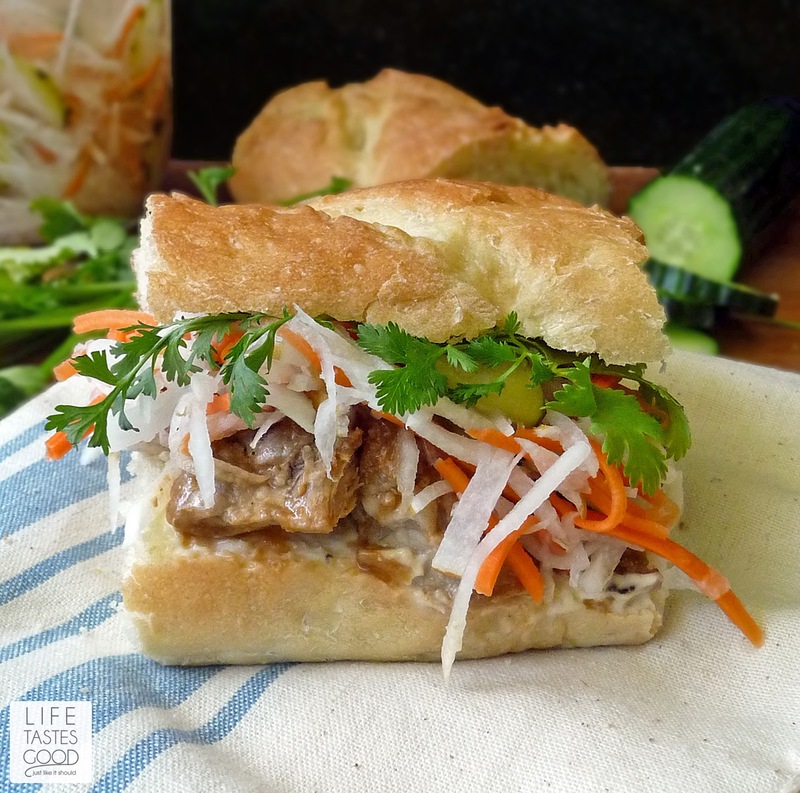 The Banh Mi is a baguette filled with various ingredients, but typically meat and pickled vegetables. This sandwich packs a big flavor punch! The first time I tried it, I was so surprised at the wonderful flavors I nearly fell out of my chair! It was love at first bite, and now I have regular cravings for the complex flavors of this unique sandwich. The bread is light and airy with a thin crispy crust. 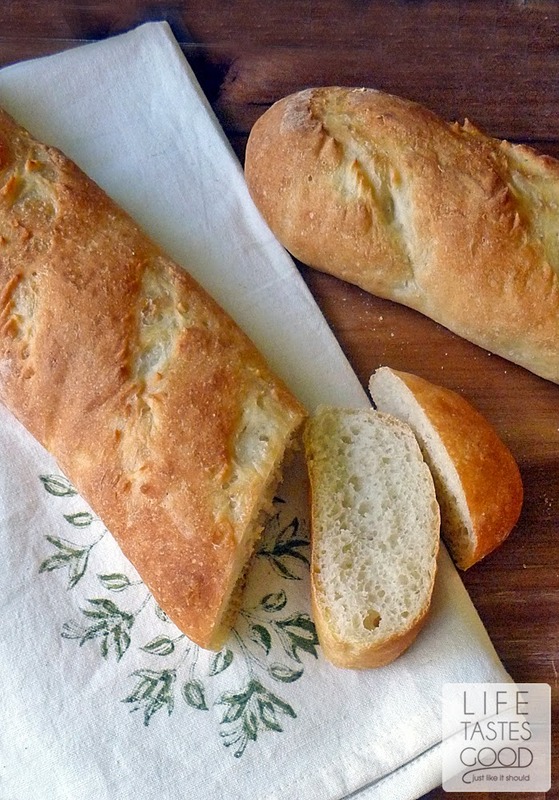 It does take some effort to make the homemade bread, but it is very much worth it. This baguette is a delicious wrapper for the pickled veggies that are fantastically easy to make and the equally easy and flavorful pork filling. Everything works together in perfect harmony to create a perfectly balanced sandwich that will make you happy happy with each and every blissful bite! Heat a skillet over mid-high heat. When heated add 1 tablespoon olive oil. Then add 1 lb pork strips to the hot olive oil and let them sear for a minute or two. Turn them over and sear the other side another minute or so. When seared, remove from pan and set aside. Reduce heat to medium and add 1 cup diced yellow onion to the skillet and saute until they start to soften. Add 1/2 tablespoon ginger and 1 tablespoon garlic. Saute a minute more until fragrant. 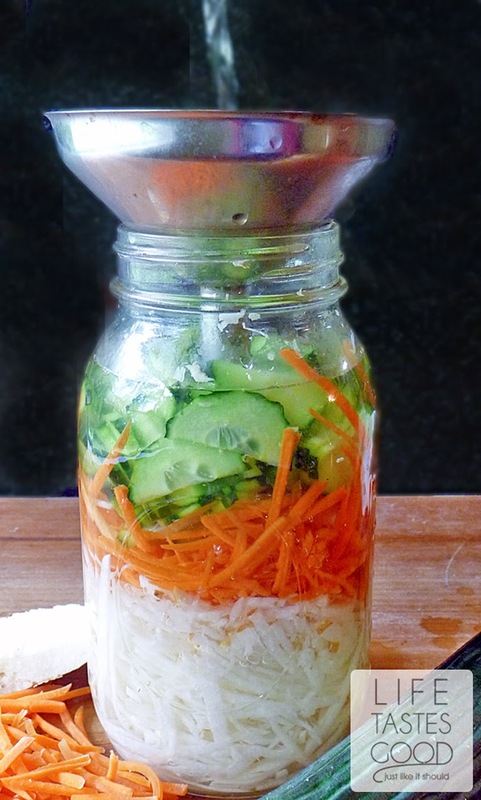 Add 1/4 cup pickling liquid and cook another couple minutes until reduced by half. Add 1/3 cup water, 1 teaspoon chicken base, 1/4 cup fish sauce, 1/4 cup hoisin sauce, and pepper. Give it a taste and adjust the seasonings as needed. As many of these ingredients are salty, I wait to taste the sauce to see if it needs to be salted. Simmer this until thickened and add the pork. Cook another 5-10 minutes until the pork is cooked through. Assemble the sandwiches. Slice the baguette into the sandwich size you like and split one side to make an opening to put the filling. Spread the inside of the bread with mayo to your liking and top with 1/4 of the pork mixture, about 1/4 cup of the pickled vegetables (more or less according to your liking), some fresh cilantro and sliced jalapenos. Serve and enjoy! Follow Life Tastes Good's board Life Tastes Good: Sandwiches on Pinterest. haha too funny! 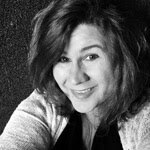 Thanks, Bobbi! This looks so so good Marion! 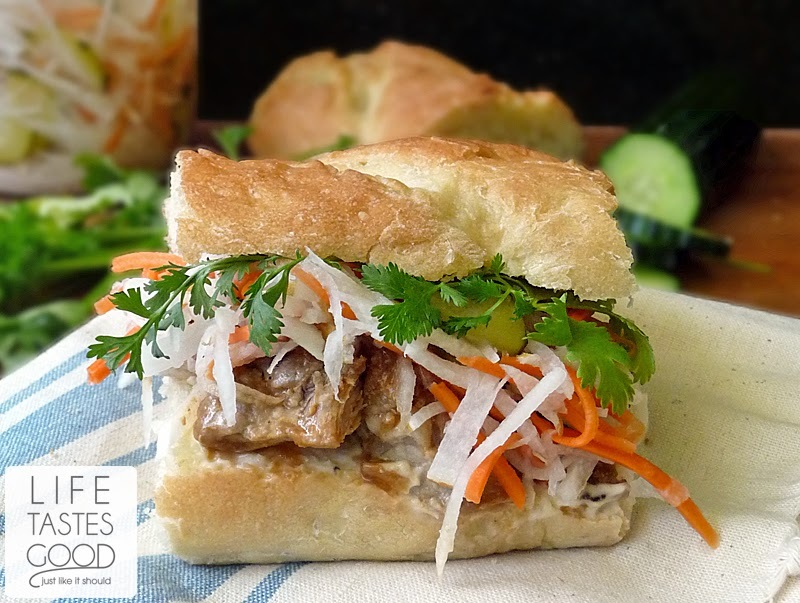 I've never had Bahn mi but I have really been curious and thinking I should try it - your's looks absolutely delicious! Thanks, Erica! I tried it for the first time at the Food and Wine Conference and fell in love. This is a little different from what I had there, but both were soooo very good! Oh wow! This is one amazing looking sandwich, Marion! :) And I love that each component is pretty much homemade. Yum! Thanks, Carrie! I love it is homemade too. With the exception of the bread, it is pretty easy to make. The bread is worth the effort, but it is time consuming for sure. Thanks again! Hi Marion, This looks SOOOO good. It is making me hungry. I'm going to have to make this soon. Thanks, Michele! I hope you like it. What a pretty sandwich! I love all the different flavors going on in this recipe! This is one of my absolute favorite sandwiches. I can't wait to try your recipe. Pinned! I will order the Banh Min chicken sandwich at Pho-Yum. I really just need to make my own! This looks delicious!